A rise in drone use may require 'specific legislation' if privacy becomes a major issue in the UK, a leading photography rights lawyer has said. Yesterday, we reported that the US state of California has outlawed the use of drones for taking photographs of someone’s property. A fortnight earlier, a camera-equipped drone was reportedly shot down in a suspected privacy dispute between neighbours in New Jersey. Drones were back in the headlines last night. A Euro 2016 football qualifier between Serbia and Albania was abandoned after a drone was reported to have carried a flag and a political message, sparking trouble. London-based lawyer Charles Swan explains that drone use is ‘a massive area’ legally, with different laws that may apply to different situations. He tells Amateur Photographer: ‘Whether current privacy, harassment, trespass and other laws in the UK are adequate to deal with disputes involving drones remains to be seen, as and when the use of drones becomes more widespread in the UK. Swan adds: ‘In Baron Bernstein of Leigh v Skyviews Ltd, a 1970s case which every law student comes across in law school, it was held that an aeroplane used to take aerial photographs of the estate of Lord Bernstein of Leigh, former owner of Granada TV, did not trespass on his land. Swan says it is not clear to him how this case would apply to low-flying, camera-equipped drones. These days, drones can be picked up for just a few hundred pounds. In the UK over the summer, an AP reader said he witnessed an incident at a car rally in Brighton, East Sussex when a drone apparently crashed onto spectators, causing injuries. And, just last week, Amateur Photographer’s online production editor, Paul Nuttall, says he saw a drone flying over his home in Tooting, south-west London. ‘I was in my garden at around 10.30pm on Wednesday 8 October investigating a rowdy party a few doors down, when I heard what sounded like a quite loud and high-pitched whirring’, he says. ‘I looked to the west of our south-facing garden and spotted a hovering object rise from near the horizon. ‘It wasn’t particularly large, but was certainly large enough that you could make out a pair, or quartet, of legs and what appeared to be rotors or fans above them. Paul says the object gradually moved overhead, travelling steadily the whole time at a height of no lower than around 60-70ft. The Information Commissioner’s Office, the UK’s privacy watchdog, treats photos as data, but ‘domestic’ use of drone-captured images is completely exempt from the Data Protection Act. Journalism, literature and art are also exempt from the Act, under Section 32 of the 1998 legislation. Unless exempt, drone users must comply with the Act if the images are for business use and the people pictured are identifiable. Data protection rules give people in such images a right to ask for their photos to be deleted if they have not given consent beforehand. And drone operators must alert potential subjects that they plan to use the device for such purposes in a given area. Hobbyists don’t need permission from the UK’s Civil Aviation Authority (CAA) to operate a drone, unless they plan to fly it close to people or objects. Specifically, this means flights over or within 150 metres of any congested area; over or within 150 metres of an organised open-air assembly of more than 1,000 persons; or flights within 50 metres of any person, vessel, vehicle or structure not under the control of the pilot. No specific permission from the CAA is required for a landowner to operate a drone over private land, subject to the safety distance rules. But permission of the landowner would be required if an unmanned aircraft is taking off and landing from private land. Flights are restricted to 400 feet above surface-level, unless appropriate air traffic control unit permission is obtained. A growing number of videos have appeared online in recent months, documenting the controversial use of drones. 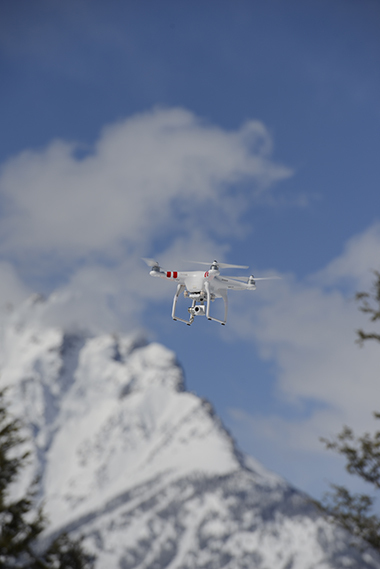 In the June, the National Parks Service in the US banned use of the unmanned aircraft outright.